This was a spur of the moment ebay pick-up. 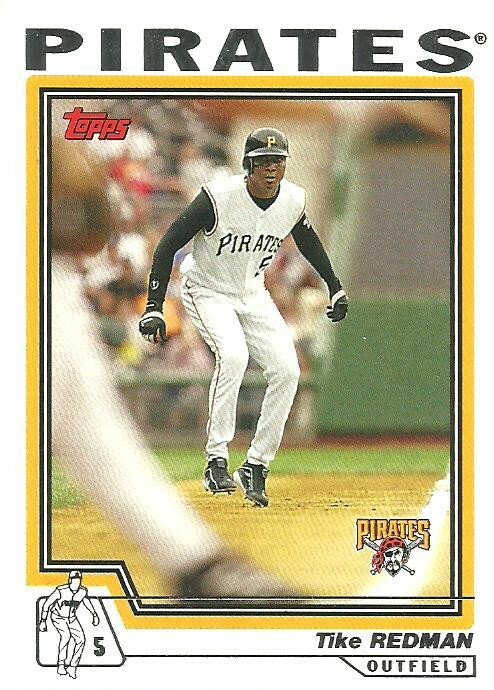 I did a search of all baseball cards ending soonest and I saw this card and knew I wanted it. It only had a few minutes left and didn't have any bids yet, so I bid $0.99 and got it. $3.49 total with shipping. 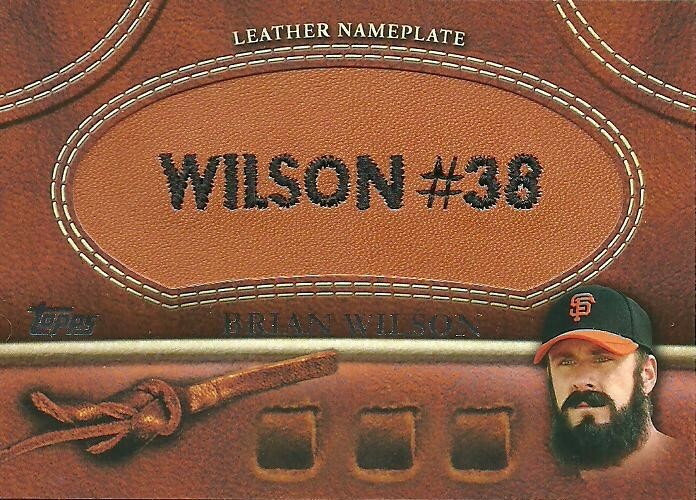 My last name is Wilson, so I just thought it looked cool. Now I need to get the black leather version. Click here to check out the contest over at Royals and Randoms for your chance to win a BIG PILE of cards. 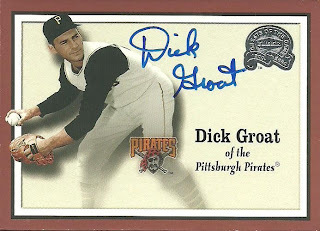 I have been getting some great cards on eBay recently. 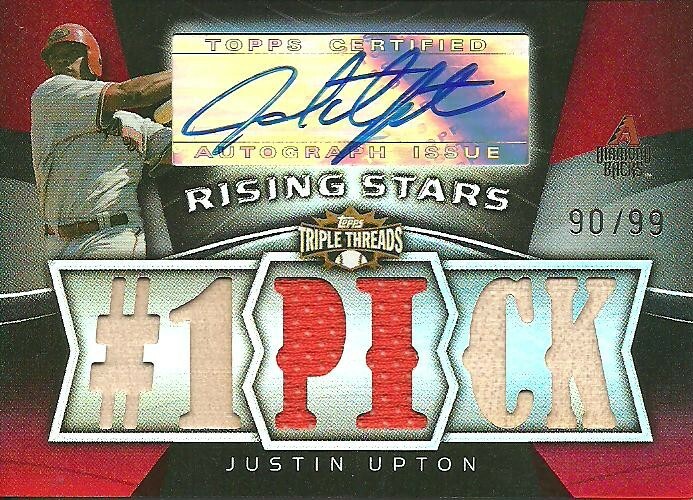 Here is a 2009 Topps Triple Threads Rising Stars Justin Upton Auto numbered 90/99. 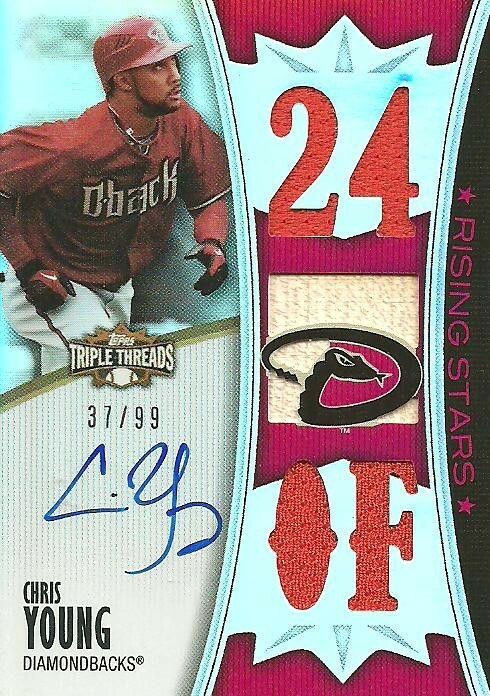 The card features 2 bat pieces behind the "#1" and the "CK" and an orange jersey piece behind the "PI". 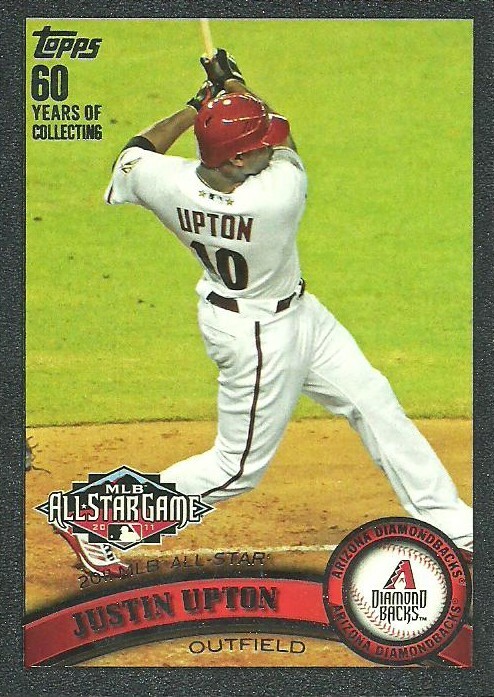 I'm not sure when Upton has ever worn an orange jersey. 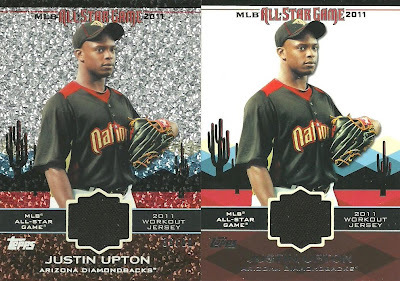 I'm thinking it must have been from a 2009 All Star weekend event, but I'm not sure. The card looks great though and it is my first J-Up auto, so I'm really excited. 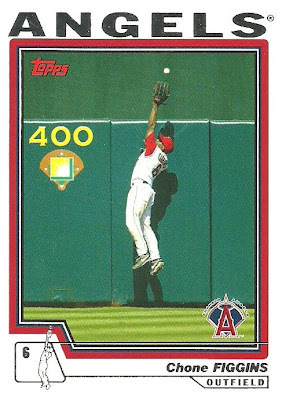 I was actually trying to get the version that is numbered to 50, but lost out at, literally, the last second of the eBay auction. It went for $19.01, plus shipping. After missing out on that one, I did a quick search and found this one. I has about three days left. 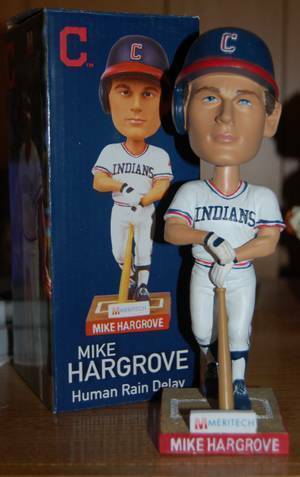 The starting bid was something like $44.95, but it had a best offer option. I put in a best offer bid of $15 and put in a little note stating that the one numbered to 50 had just sold for $19 and I included the item number. 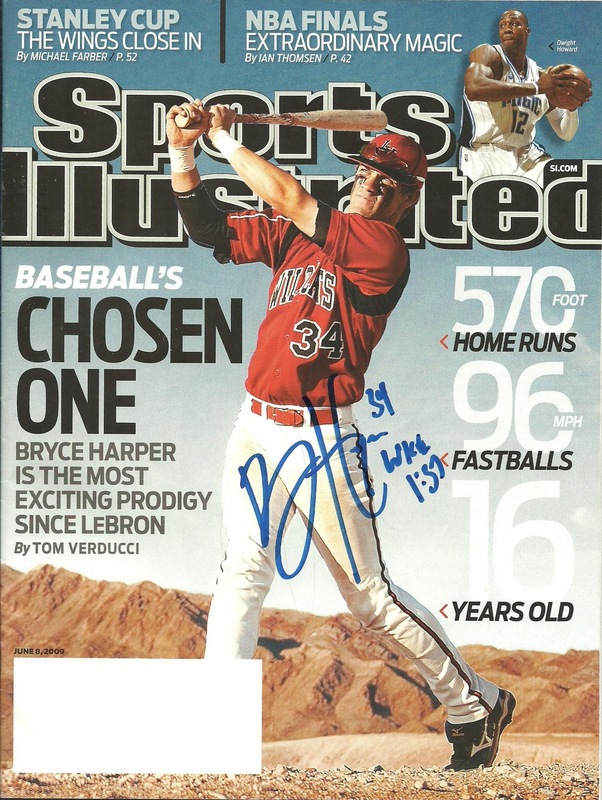 I was still a little surprized that my offer was accepted since the starting bid was so high. Shipping was $2, so I got it shipped for $17. 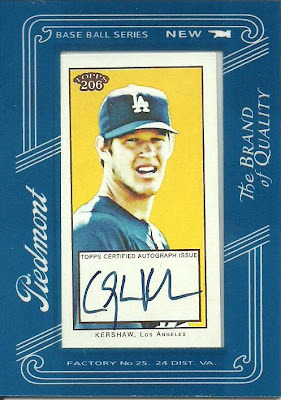 I picked up this 2009 Toops 206 Clayton Kershaw auto from my local card shop today. I was looking at his certified autographed cards on eBay recently and I think that I should be able to flip this card for a little profit. 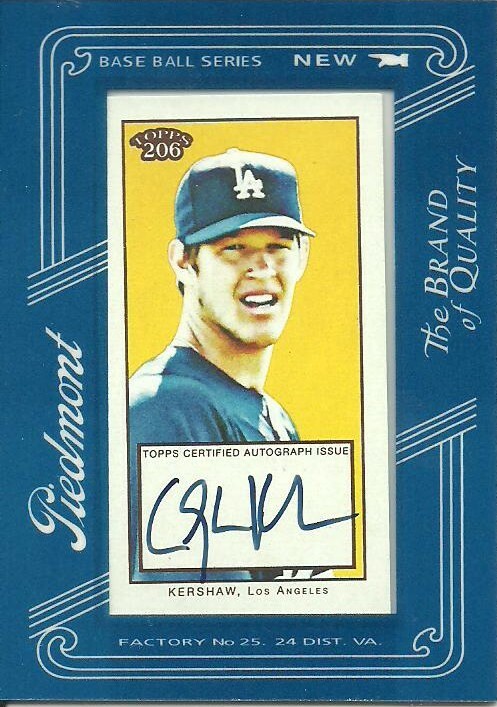 I like the blue border, since he is a Dodger, and the fact that is it an on-card auto is also nice. I checked on eBay when I got home and I don't think this particular auto listed at all, so I will get it listed tomorrow and see if I can make enough to cover the two other cards that I bought for my kids today at the card shop. Two eBay packages came in the mail today. 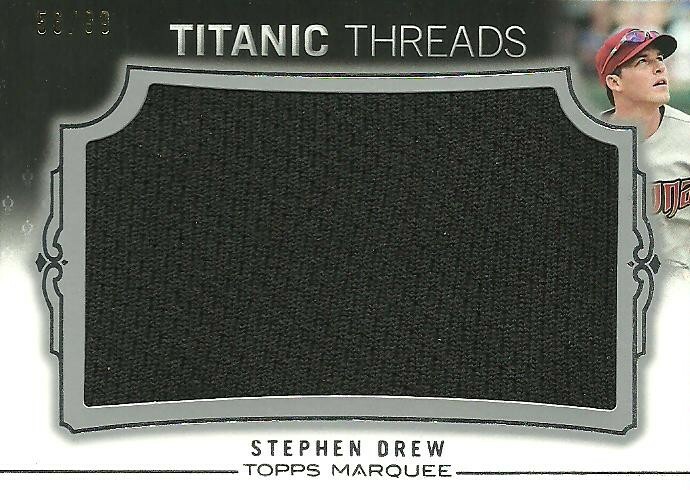 First up was this 2011 Topps Marquee Titanic Threads Stephen Drew Jumbo Jersey Card. This is a sweet card! It's numbered 56/99 and I got it for $3.49 shipped. Next up is a group of 8 different auctions that I won from the same seller. 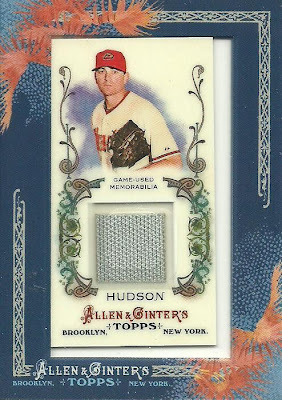 It was $1.00 shipping for the first card and free for each additional auction. 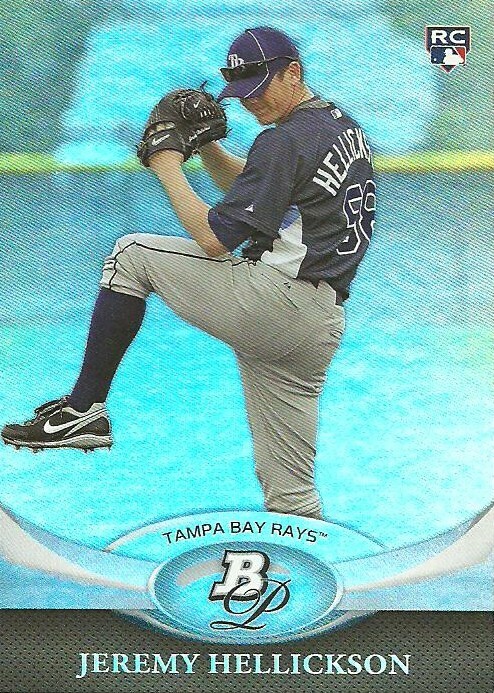 I won this 2010 Bowman Platinum Jeremy Hellickson Rookie Card and then spent an additional $0.07 for the other 9 cards. So for the 10 cards listed below I paid $1.57 shipped. I have a lot to be thankful for this Thanksgiving! I have a wonderful wife and three amazing boys! I have a strong faith and a wonderful extended family. I have a great job and work with some great people. And then there's baseball. I'm grateful for MLB, baseball cards, the Arizona Diamondbacks, the blogosphere, trades, eBay, relics and autos, rookie cards, my PC, and sweet cards for under $5 bucks. With that said here are a few recent sweet eBay pick-Ups for under $5 bucks that I am thankful for. This is more of a reminder to me as far as when I sent out some TTM requests. 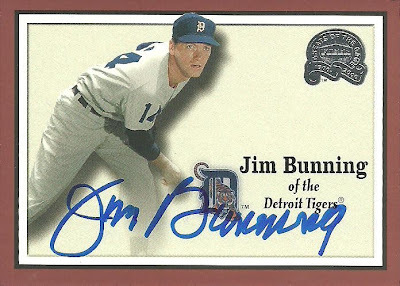 Today I sent out requests to Don Baylor, Jim Bunning, and Phil Garner. 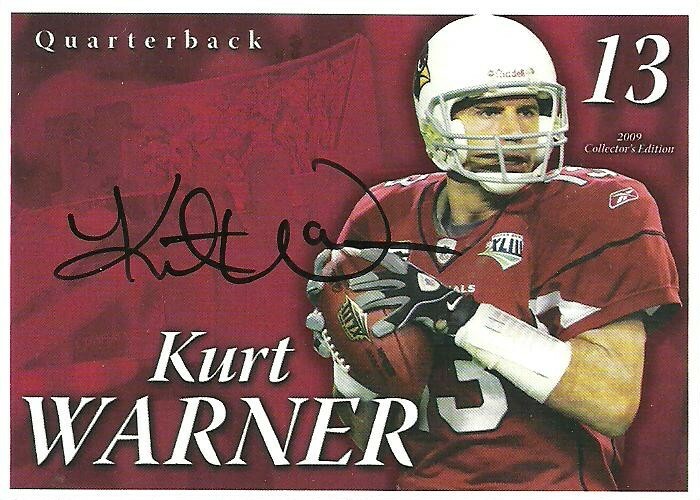 I sent a request to Kurt Warner last week, but other than that, I haven't sent out any TTM requests in a while. Hope to get some more TTM requests sent out and see some results in the coming weeks and months. I mentioned in a post last week that I am trying to see if my boys have any interest in baseball cards. I tool them with me to the card shop and told them they could each have $2 to pick out a card. My oldest is 5 and a half and my middle boy is almost 4. 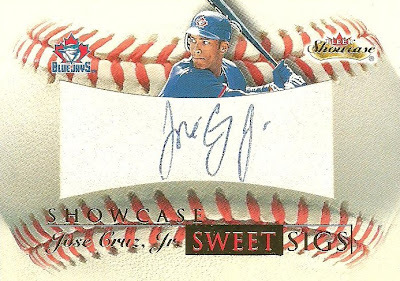 I flipped through the cards in the $2 relic/auto box and my oldest son picked out this 2000 Fleer Showcase Sweet Sigs JOSE CRUZ JR. Auto. My other son, kept picking out cards in the showcases that he liked and I had to keep explaining that he only had $2 to spend and that most of the cards he was looking at were way more than $2. Finally he saw some 2007 UD Masterpieces Jersey Cards that he liked. 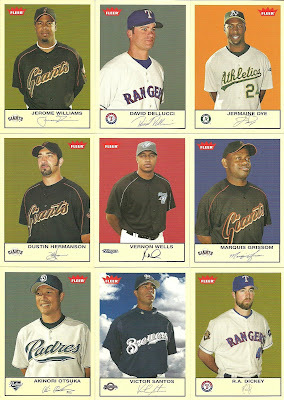 There were several that were $2 (Jason Bay,etc. ), but I helped him pick this Craig Biggio Captured on Canvas Jersey card, which was $3 so that he would have a future Hall of Famer relic card for his collection. I bought them magnetic cases (which cost almost as much as the cards) for their cards so they can keep them nice and display them. They seem somewhat interested in cards and I'm going to see if I can pick up a few quality cards for them for Christmas to try and help build them a nice collection. 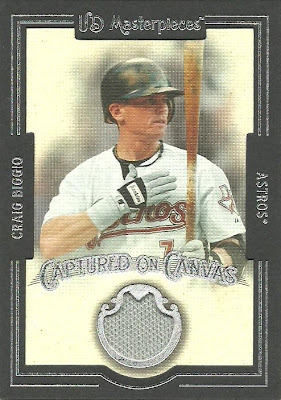 Labels: Craig Biggio, Jose Crus Jr.
to know that there were some great photos used in 2004 Topps. He also wants you to help me decide between two different collections to pursue. First up are three great looking cards that I found while looking through a box recently. Next up, help me decide which collection to pursue. Dan Wilson player collection (you see, my name happens to be Dan Wilson, so I feel obligated to collect him). 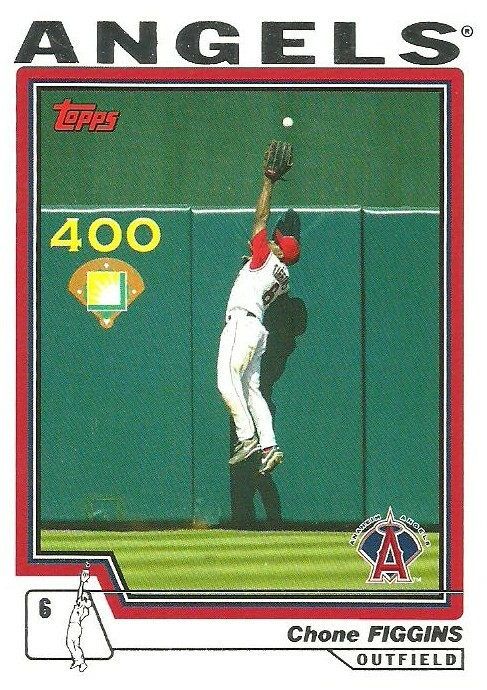 I came across this card in the stack of 2004 Topps and it renewed that sense of obligation. Or, my other thought is, and has been for a while to collect cards featuring players with awards/trophies that they have won. They are out there, but aren't very common, so it would make it a fun challenge. So there you have it, Dan Wilson or Trophies, or both? I'm assuming that I'm going to be preaching to the choir here, but how come my wife doesn't understand that if our family goes to Dairy Queen for a tasty treat and I choose not to partake, then I should be able to spend a few bucks on baseball cards. It seems like a pretty simple concept to me, but every time a situation like this occurs she gets really upset. I just don't get it. I could have spent money on item A, but I choose not to. 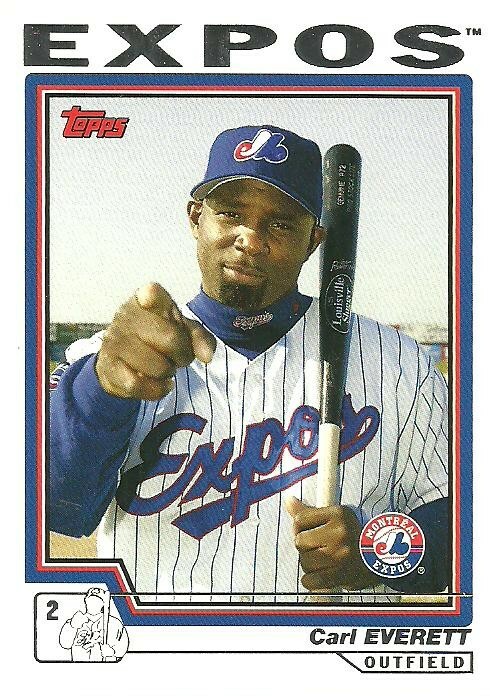 Instead, I choose to buy baseball cards. Yesterday we were out and about and decided to go to Dairy Queen, which happens to be close to my local card shop. 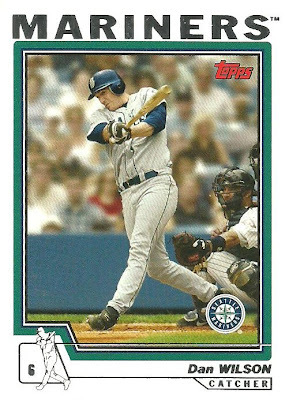 I told my wife that I didn't want anything at Dairy Queen, but that I would like to stop by the card shop and pick up a card that I had seen there just a few days earlier. I got "the sigh" and "the rolling of the eyes" from her and "the talk" about how I am spending too much money on baseball cards. 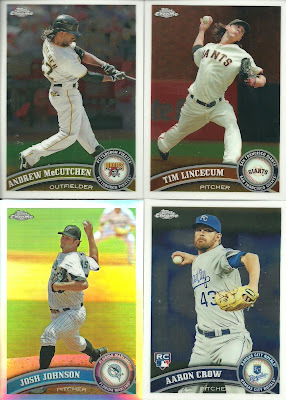 So, without further ado, here are the cards I got at the card shop. 2003 Bowman Chrome Brandon Webb Rookie Card - I was pretty sure I didn't have this one already and for $0.75 it was too cheap to pass up. 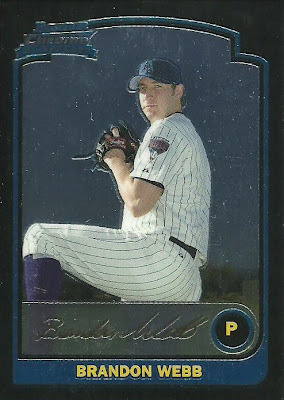 After getting home, I checked and I did not already have this one, so that puts me at 195 different Brandon Webb cards. 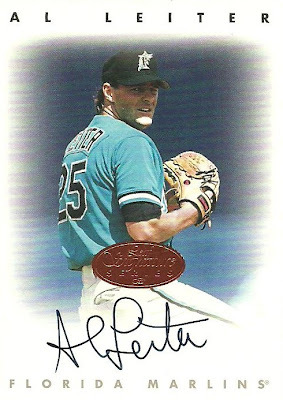 1996 Leaf Signature Series Al Leiter Auto - I was watching a Roberto Clemente tribute on MLB tv the other day and they featured Al Leiter because he was one of the winners of the Roberto Clemente Award. I had seen this in the $2 box the last time I was at the shop and wanted it. So there you have it. I spent a whopping $2.75 at the card shop, which is about what my wife spent on her Dairy Queen blizzard. Maybe some day she will understand, but I doubt it. 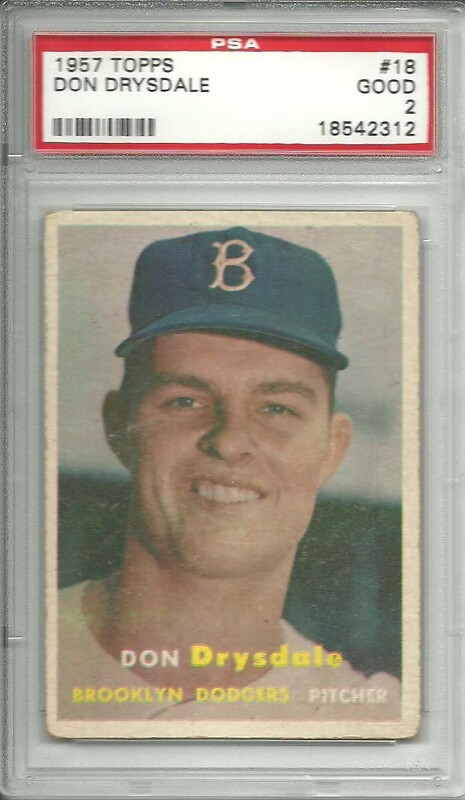 I picked up this 1957 Topps Don Drysdale Rookie Card on eBay and it arrived today. It's a PSA 2, which is why I was able to afford it. Even with it being graded at a 2, I think that it's in pretty good shape for being over 50 years old. 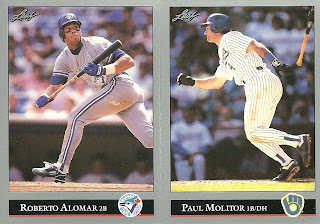 With older cards I don't mind if they are not in perfect shape. 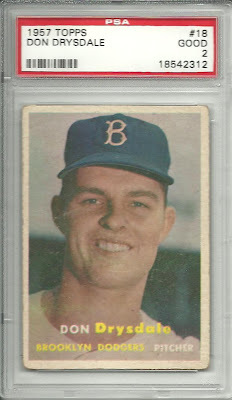 I might try to see which other Hall of Fame rookie cards from the 50's I can pick up for around $25. 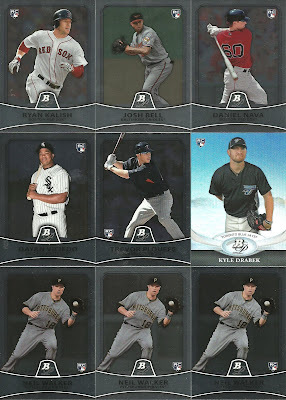 Yesterday I took my two oldest boys, Kolby 5 and Brady 3, to the card shop. I'm trying to get them into collecting, so I told them that they could each have $2 to buy their very own card. 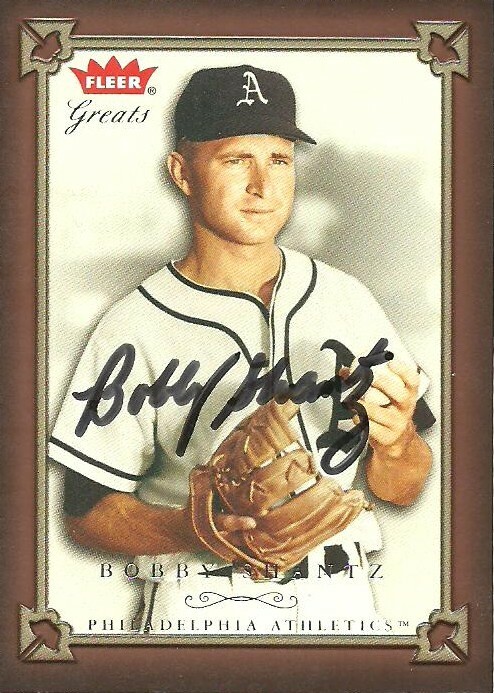 My 5 year old picked out a really cool auto with his $2 and I was able to finally help my 3 year old pick out a jersey card of a future Hall of Famer. I'll post their cards soon. 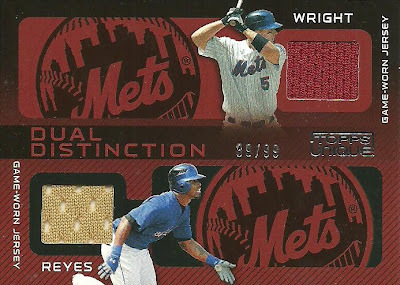 I picked up this 2009 Topps Unique Dual Distinction David Wright / Jose Reyes jersey card numbered 89/99 for $2. The Wright jersey is red and the Reyes jersey is gold. My question is, what jersey do you think these pieces are from? I'm thinking maybe an all-star game weekend jersey, but I'm not sure. Let me know what you think. Thanks! A while back I stumbled onto a website call swagbucks.com. After signing up, which is free, you can earn Swag Bucks by searching the internet, participating in daily polls, watching videos, etc. 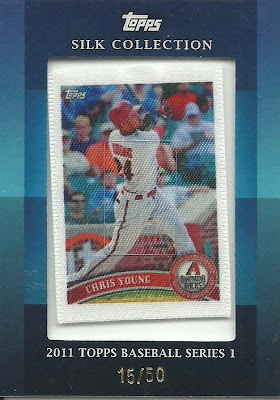 You can redeem your Swag Bucks for a variety of prizes including gift cards, video games, and baseball cards. Like I said, it's free to sign up and I just use the search function instead of Google and you randomly earn Swag Bucks with that and then I also get 1 Swag Buck each day from the daily poll. It took my about a month or so, but I earned 680 Swag Bucks and redeemed them for a 1981 Topps Jack Perconte/Mike Scioscia/Fernando Valenzuela rookie card. The card came today (free shipping). I scanned it. 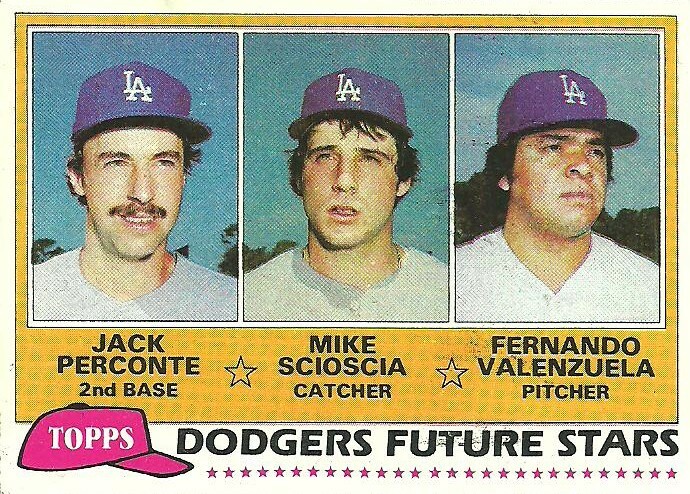 It's not a gem mint card, by any means but it is in decent shape and it is 30 years old. Click on the link on the top right hand corner of my blog if you want to sign up. If you sign up through this link then I get credit for it. Check it out and earn some free cards! Schuyler over at Schuyler's Stuff had a contest a week or so ago and I was one of the winners. He sent me a nice package of cards as my prize. 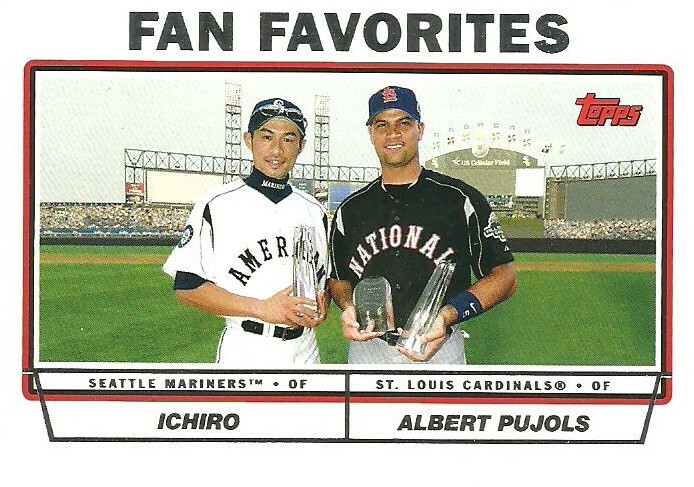 He included some D-Backs, 2011 Topps and Bowman, and a pack of 1992 Leaf. Here are some of the highlights. Thanks Schuyler! First up, some of the D-Backs: Montero, Finley, and Konrad Scmidt RC. 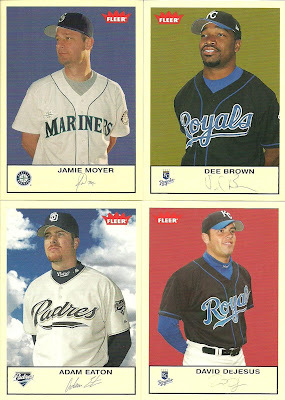 Next, some of the 2011 stuff: Valverde, Howard, and Reyes. 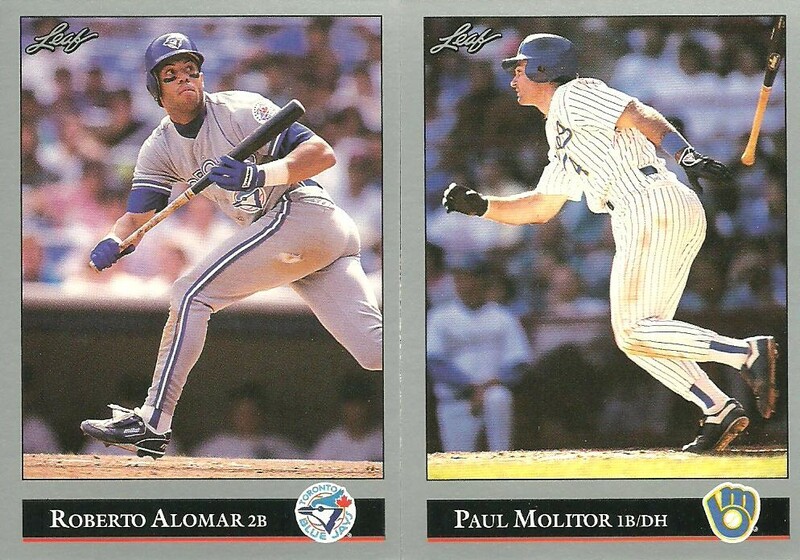 Lastly, the highlights of the 1992 Leaf pack: Hall of Famers Alomar and Molitor. 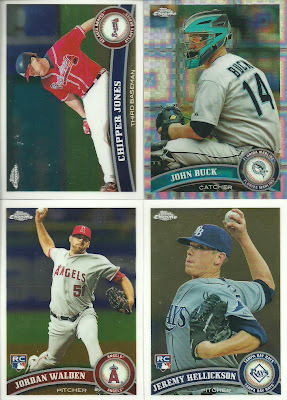 I picked up these 4 Ryan Roberts 2011 Topps Update parallels on eBay, and they all came this week. 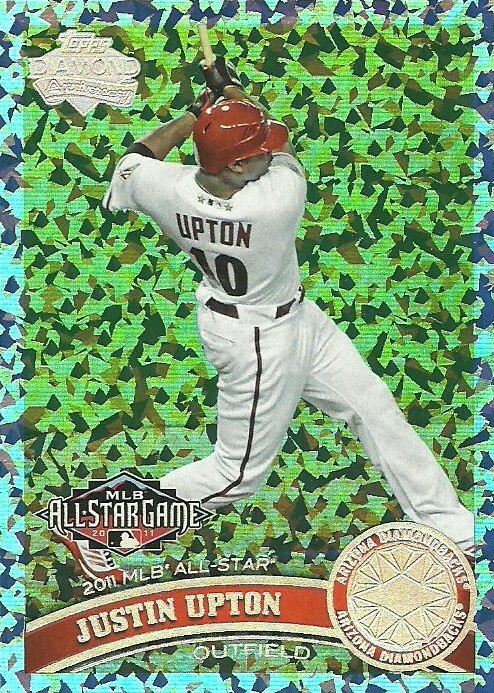 I haven't bought any packs of this years Update, so I still need the base and diamond parallel. If anybody out there has them for trade, let me know. Thanks! 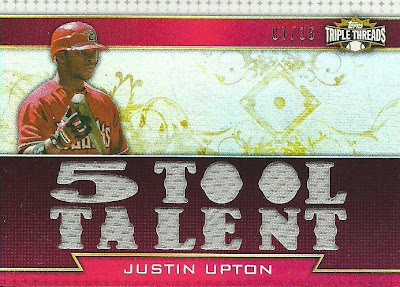 Is Justin upton a 5 Tool Talent? Topps thinks Upton is a 5 Tool Talent and I agree. I picked this card up on eBay recently and got it in the mail today. Who are other current players that you consider to be 5 Tool Talents? 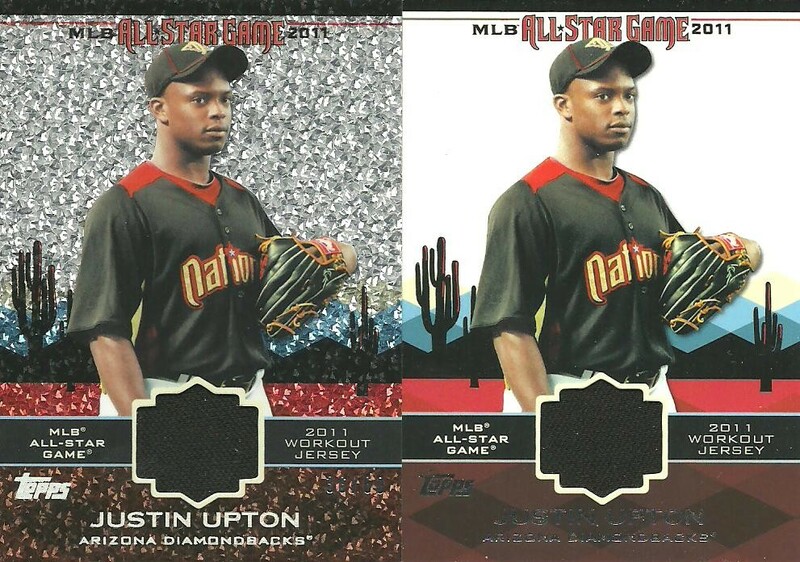 I picked these cards up separately from different sellers on eBay this past week, but received them both in the mail today. The one on the left is numbered to 60 and I got it for $4.75 shipped. The card on the right is the regular version and I got it for $4.00 shipped. $8.75 for both is not bad if you ask me. I'm picking up singles from this years Update and trying to stay away from packs and boxes. 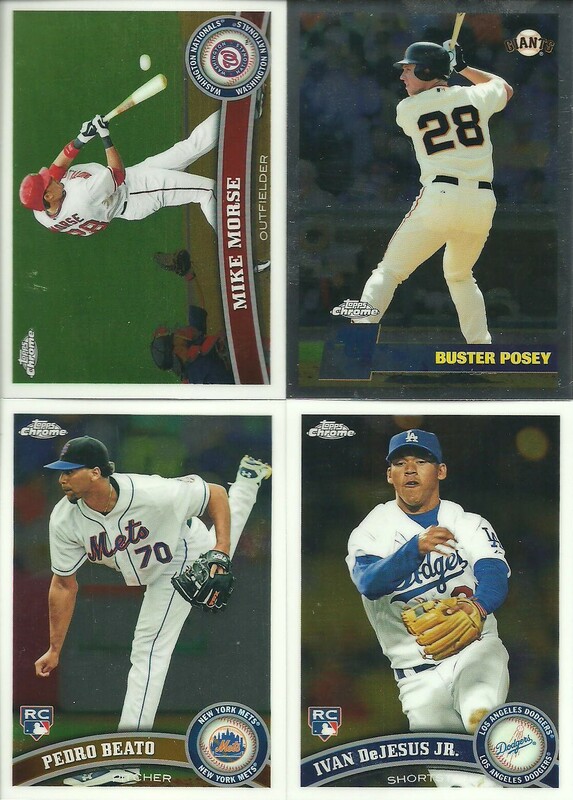 I'll have some more cards to post soon that I picked up on eBay. I've picked up a few things on eBay this past week and they are starting to arrive in the mailbox. Here is a ticket stub that I picked up for a total of $4.99. You might be asking yourself, "Why would he pay 5 bucks for a ticket stub from a meaningless game between the Brewers and the Diamondbacks from 2010?" Well, let chek out the description from the eBay auction which states "Neat vintage full ticket in excellent condition. 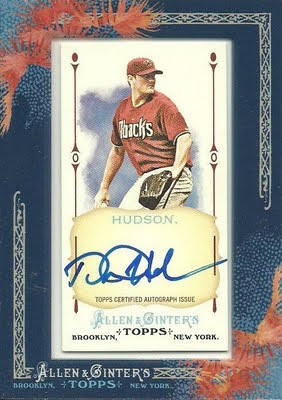 From a game in which Daniel Hudson pitched for the win and home runs were hit by Stephen Drew and Prince Fielder." You might still be asking yourself, "Why would he want this ticket?" 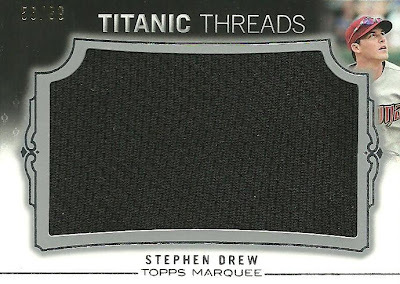 The eBay seller mentioned the hom run hit by Stephen Drew, but what he didn't mention was that the three D-Backs batters before Drew also hit home runs. That's right Adam LaRoche, Miguel Montero, Mark Reynolds, and Stephen Drew hit back to back to back to back home runs in that game. My plan is to try to get the ticket signed by those 4 players. 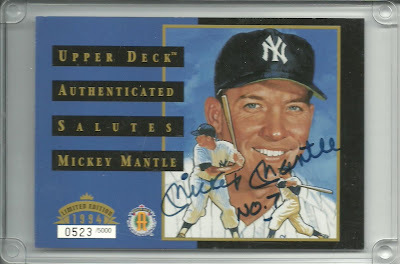 I bought this Mickey Mantle autograph from a card shop back in 1999 or 2000. The card shop had recently purchased a large collection from someone and this was part of it. 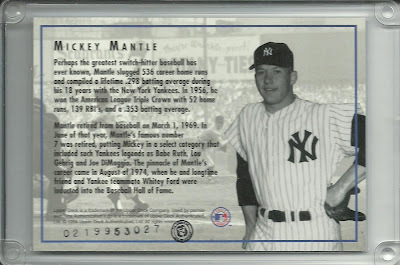 It came with a Certificate of Authenticity (which I haven't been able to find since we moved back in July) and a picture of the guy with Mickey Mantle at a card show. The card can be seen on the table in front of Mantle. So while it appears that some of these cards were autographed by Mantle and sold by Upper Deck, I don't think that this one was. 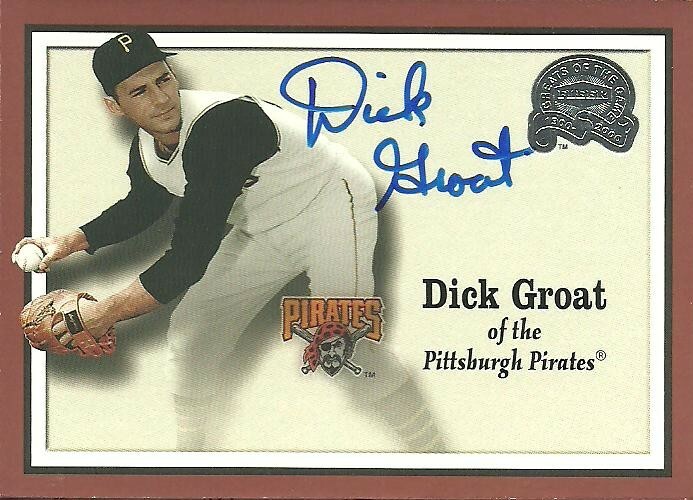 It appears that it was bought unsigned and that Mantle signed it at a card show. I recently notice a serial number and stamp on the back of the card. It card be seen on the bottom left hand corner. I can't make out any of the writing in the circle. I'm assuming this is from the company that provided the certificate of authenticity. Is anyone out there familiar with this stamp/company? Any help would be greatly appreciated.